Hi all! It's Deasy here. 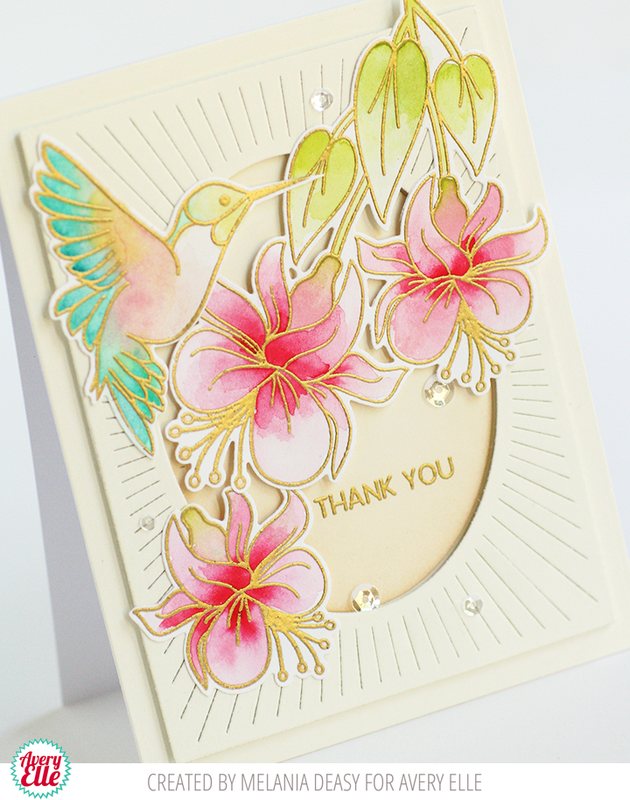 Today I want to share my card for Avery Elle featuring Hummingbird Stamp Set! This set is so gorgeous and pretty! For my card today, I color it with watercolor. I have so much fun! I stamp the images, heat emboss with gold embossing powder, color the images using watercolor then die cut it. The sentiment is from gold embossing powder. To add some shadow, I apply Dye Ink with blending tool in the inside of the frame. For the embellishment, I add clear sequins. Thank you so much for stopping by and happy crafting! Your many gorgeous cards using this adorable hummingbird stamp set are wonderful examples! Your first one is so ethereal becaause of your beautiful coloring! Wonderful !! Loved the gold embossing,colors and card design ! A Gorgeous Card By Yainea!